She'll look as sweet as sundae in this Kenzo Kids™ Food Print Two-Piece Set. Banded, jewel neck top. Back snap placket closure. Short, dolman sleeves with turned cuffs. Branded, ice cream graphic along the front. High-low hemline. Stretch waist leggings. Slim fit with food character print throughout. Top: 100% cotton. Bottom: 96% cotton, 4% elastane. Machine wash cold, tumble dry low. Imported. This item may ship with an attached security tag. Merchandise returned without the original security tag attached or a damaged tag may not qualify for a refund. Measurements: Length: 13 1⁄2 in Waist Measurement: 18 in Outseam: 17 1⁄2 in Inseam: 10 in Front Rise: 8 in Back Rise: 9 in Leg Opening: 6 in Product measurements were taken using size 2A (2 Toddler). Please note that measurements may vary by size. 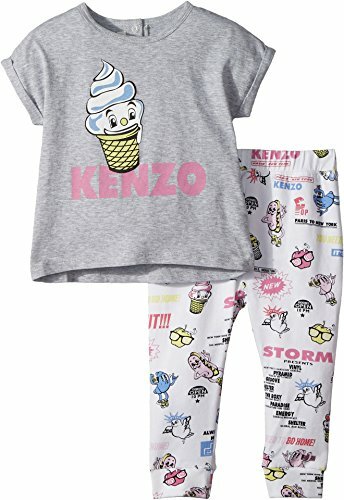 She'll look as sweet as sundae in this Kenzo Kids™ Food Print Two-Piece Set.